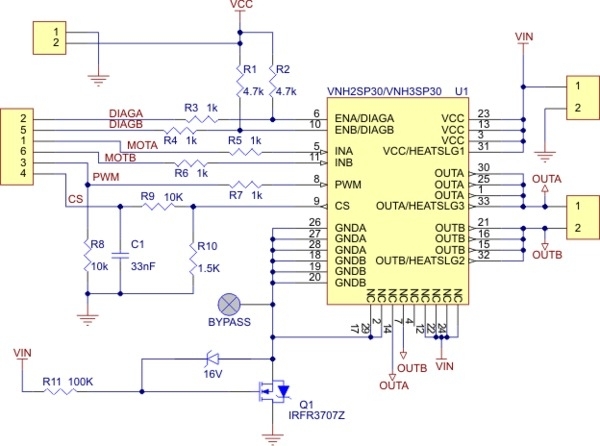 Note: Only the VNH2SP30 and VNH5019 support current sense; the current sense circuit might not be populated on the VNH3SP30 version of the board. For more information on the differences between the motor driver versions, see the comparison table below. In a typical application, the motor power supply is connected at the bottom of the board, the motor on the right side of the board, and the control connections to the left side of the board. 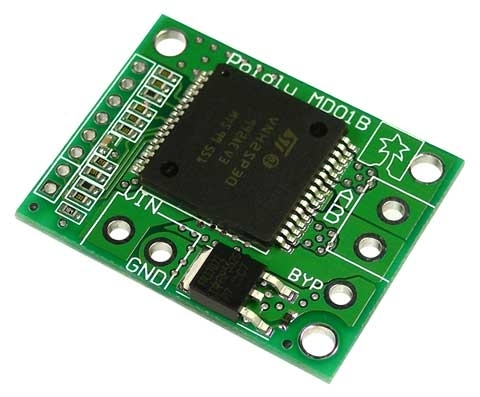 The diagnostic/enable pins are pulled high on the board and can be left disconnected if you do not want to monitor the fault conditions of the motor driver chip. INA and INB control the direction of the motor, and the PWM pin turns the motor outputs on or off, allowing you to control motor speed with a supplied pulse width modulation (PWM) signal. 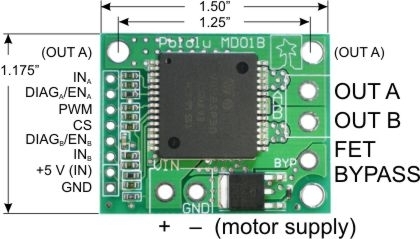 The PWM pin is pulled low on the board, so the motor driver outputs are effectively disabled by default; the INA and INB pins are floating (they are not pulled to any particular default voltage). See the truth tables in the VNH2SP30/VNH3SP30 datasheet for more information on how the INA, INB, and PWM pins affect the driver outputs, OUTA and OUTB. For the VNH2SP30 version, the current sense (CS) pin will output approximately 0.13 volts per amp of output current. If you want to add current sensing to the VNH3SP30 version, or if you want higher-accuracy current sensing with the VNH2SP30 version, please consider our ±30A ACS714 current sensor carrier.